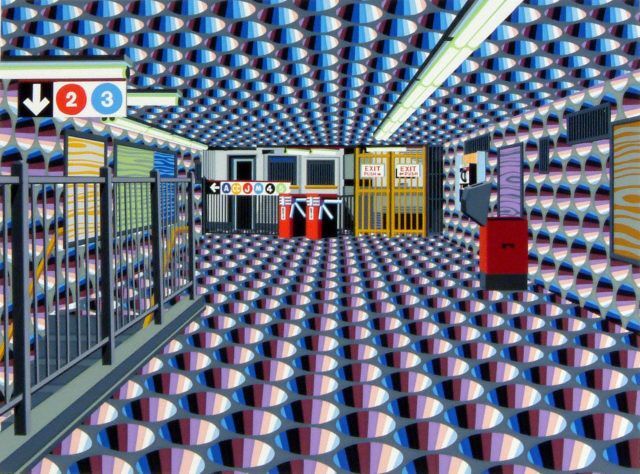 Masaaki Sato, Subway No. 24, 1978. Serigraph. 17 x 23 in. (43.2 x 58.4 cm). WhiteBox is excited to present “A Colossal World: Japanese Artists and New York, 1950s – Present,” a group exhibition curated by Kyoko Sato. Spanning the entirety of WhiteBox’s two-leveled exhibition space, the show features the video, sculpture, murals, installation, and two-dimensional media works by over 50 Japanese artists who emigrated to New York during the formative stages of their careers. In the wake of the Second World War, Japan’s relationship with the United States became further complicated with the U.S. occupation of Japan and the influx of American culture. At the same time, the center of the art world moved from Paris to New York. The loosening of social and economic constraints in Japan allowed the emergence of a number of remarkable artists who produced increasingly avant-garde works. Dreaming of the expanded art world available through the New York art scene, many of these Japanese artists migrated to New York. The city provided these artists new platforms for expression and provocation—for example, pioneering artists like Yoko Ono, Shigeko Kubota, and Ay-O were able to contribute further to the burgeoning Fluxus movement, and Shusaku Arakawa and Ushio Shinohara to Neo-Dada, working with and around New York figures like John Cage, Nam June Paik, Alison Knowles, Allan Kaprow, Robert Rauschenberg, and Jasper Johns. Also, growing globalization and the development of international art movements allowed artists to traverse the distance between New York and Japan and split time between the two nations, allowing them to be truly bi-cultural. In the post-economic bubble of the 1990s, when people became disillusioned with the myth of Japanese safety in the wake of economic depression, natural disaster, and terrorism, another major wave of emigration to New York occurred. Many of these artists, including Takashi Murakami and Tomokazu Matsuyama, explored the convergences between art and popular culture, from anime-inspired aesthetics to collaborations with major fashion labels. In the uncertain years since the recession of 2008, emerging Japanese artists have continued to emigrate to New York, reflecting today’s globalized culture and securing an ongoing legacy of artistic exchange. Throughout the exhibition, visitors will see the particular ways in which Japanese artists have contributed to the betterment of New York City’s cultural landscape—from mid-century avant-gardes to emerging contemporary artists pushing new boundaries. The exhibition will not be chronological, but will juxtapose works from different periods to show various themes and threads of influence. The intent is to consider artworks as living documents alongside extensive documentation, always being reinterpreted through the present moment. “A Colossal World” features works by AIKO, Noriko Ambe, Ei Arakawa, Shusaku Arakawa, Ay-O, Eiko & Koma, Makoto Fujimura, Tom Haar, Toru Hayashi, Noritoshi Hirakawa, Ken Hiratsuka, Yasuo Ihara,Takahiko Iimura, Gen’ichiro Inokuma, KAORUKO, Emiko Kasahara, On Kawara, Takeshi Kawashima,Kenji Kojima, Miwa Komatsu, Tatsuo Kondo, Shigeko Kubota, Yasuo Kuniyoshi, Yayoi Kusama, Tadaaki Kuwayama, Sebastian Masuda, Tomokazu Matsuyama, Takashi Murakami, Nobuho Nagasawa, Rakuko Naito, Naoto Nakagawa, Toshiko Nishikawa, Masaaki Noda, Oscar Oiwa, Kenzo Okada, Yoko Ono, Takako Saito, Masaaki Sato, Hiroshi Senju, Noriko Shinohara, Ushio Shinohara, Mieko Shiomi, Hiroshi Sugimoto, Kunié Sugiura, Mayumi Terada, Yuken Teruya, thousand pictures, Yasunao Tone, Momoyo Torimitsu, Toyo Tsuchiya, Motoko Wada, Yoshimasa Wada, Yukinori Yanagi, Yoichiro Yoda, Minoru Yoshida. Curatorial Advisors Juan Puntes, Reiko Tomii and Midori Yoshimoto.